If you've followed this blog, my writings in KBDN, or taken one of my classes, you'll know that the smart home is something that I've been working towards building for quite some time. I've been trying out different systems and technologies. Some good, some bad. I'm here today to tell you about the good: The Nest thermostat. The thermostat is an ugly, unloved piece of technology that have been in homes for years. Back in the day, they had a mercury switch in them that turned the heat on when it was cold, and off when it got warm. You may remember that big dial you had to turn. Those were only as convenient and energy efficient as the person using them. Then came programmable thermostats. These were ugly, plastic hunks of circuitry that required a NASA engineer or a teenager to setup and install. No one every programmed one of those. First and foremost this is a smart thermostat, but not one that's hard to use. I pulled mine out of the box and had it installed in minutes. They even include the one tool you need to install it. Once installed, it sprung to life and walked my through setup. It was easy. It figured out what kind of furnace I had, asked my for my zip code and my wifi password, and then it was all done. I know what you're probably thinking, I had to program the thing. Not so with the Nest. All you do is use it for the first week or so. When you're cold, you turn it up, and when you're hot, turn it down. When you go to bed, turn it down, and that's it. After a week the Nest learned my habits. It knows when I get up and the house is warm by the time my alarm clock goes off. When I leave, it automatically turns it down. They even have a mobile app that lets you check on and change the temperature of your house when you're away. I've only had it for 12 months, so I can't say that it's saved me money over last year (I lived in a different place) but my instinct is that it has. This thing is very frugal about when it runs your heat, but not in a way ti freeze you out. Now what the next does from a technical standpoint is really no different than thermostats from years ago. The big difference here is that this is stylish, and brilliantly simple to use. While I do love future tech that shoots lasers and does teleportation, true innovation is when someone can take something and make it so beautiful and functional that you actually love using it. Nest has definitely achieved that here. Is the smart home really smart? We've been promised a proper smart home for many years. Are we there yet? Find out about it in October's issue of Kitchen and Bath Design News where I write about just that. The smart home is something that many big tech companies are trying to tackle. 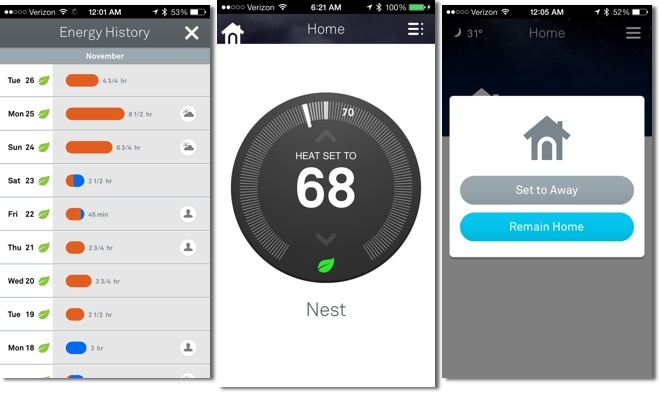 There are smart thermostats, smart appliances, and smart security systems to name a few. The promise with most of these systems is that you can control them with your smart phone to make your life easier. One of the first things I wanted to smarten up in my home was my door lock. I wanted to know that my door would lock, and unlock for me automatically. This would make my home more secure, and make entering with a bag full of groceries a lot easier. I read about Lockitron. 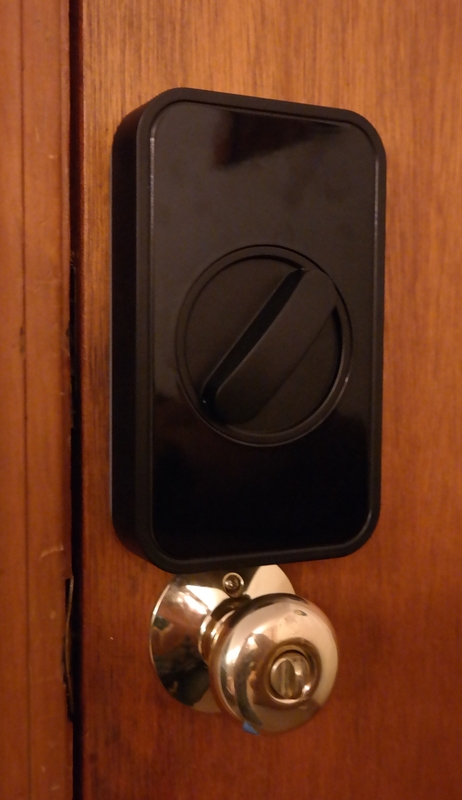 This little gizmo snaps over your existing deadbolt lock, good because I couldn't replace mine. It promised to make my life easier by eliminating the need for keys. I ordered it and a patiently waited for it. I see this every time I try to unlock my door. Then the app freezes. Installation was easy. After that, things went downhill. I learned pretty quickly that you needed to use your smartphone to lock and unlock this thing. That's great if you're away from home ad you want to check on your lock. If you're walking in, I expected it to just unlock your door for you because your phone is connected to the lock by Bluetooth. That's not the case. You have to pull your phone out, go into the app, and hit unlock. That's about as convenient as using your keys. On top of that, the lock almost never unlocks when you hit the app. You have to wait for the lock to wake up, or knock on your own door to wake it up. Call me impatient, but I'm not going to wait for 5-28 minutes for my lock to unlock, I'll just pull out my keys. On top of that, the mobile app, especially on Android is very buggy. It locks up nearly every time I use it. The iOS app is a bit better. Maybe something like the August smart lock, or the Kevo will be better. I have a Kevo here in a box that I'd like to try. I'll report once it's installed.